Zylo at the W Hotel | Bentel & Bentel Architects/Planners A.I.A. ZYLO AT THE W HOTEL, HOBOKEN, NJ - Located at the edge of a quay overlooking the Hudson River with a spectacular view of New York City, this project takes its cues from aspects of Hoboken’s cultural and industrial past as a means to ground the restaurant in its place in the present. The movie “On the Waterfront”, which was filmed on the docks, wharves and in the workers' dwellings of Hoboken, provided us with a gritty visual record and vantage point from which to look both backwards into the past and forwards to the contemporary reality of the city. With its origins as a native American encampment, Hoboken has been recently undergoing an economic and architectural overhaul that has erased much of its heritage especially along the banks of the river. The new quays along the Hudson have delivered the waterfront back to the residents but without much recollection of the shipping and shipbuilding legacy that supported Hoboken from the 1850’s to 1960’s. The new W Hotel in which this restaurant will be located characterizes the recent double-edged-sword evolution of the city. Despite the equal billing of the name of the city and the name of the hotel chain, the building supports and represents the W brand much more than it does Hoboken. To counteract the potential placelessness of the base building, we compiled a palette of materials for the restaurant that refer to its location in Hoboken specifically. The escarpments of green serpentine rock that crop up along the banks of the Hudson, as well as the rich deposits of basalt beneath them, inspired the use of serpentine to clad the horizontal surfaces of all major fixed millwork such as the bar and the waiter stations and basalt planks to form a massive seventeen foot tall kitchen enclosure that anchors the main dining room. Blackened steel and nautical bronze, which recall the shipbuilding heritage of the city, are deployed variously as floor surfaces, hanging scrims, and as a tall screen of twisted blade-like fins that separate the bar area from the dining room. Bleached quarter-sawn white oak planks, another evocation of shipbuilding, sail through the bar and into the main dining area. Bristled broom-heads, stacked like bricks up the full height of the wall at the end of the main dining room, hint at the former shop-culture of Hoboken. Spatially, our design engages the strong forms of the overall building design, but focuses these to create a finely tuned but abstract reference to the restaurant’s context to enhance the patron’s experience. 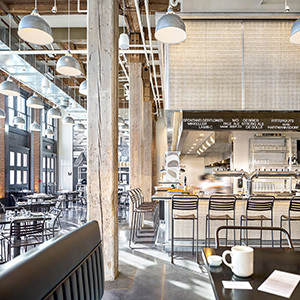 We preserved the powerful wharf-building scale of the raw space, the twenty-foot height of which is accentuated by the extreme narrowness of the footprint, but introduced ceiling elements such as the L-shape blackened steel pendant lights over the bar area that perceptually lower and humanize the scale without obscuring it. Through these channels we intend to create a restaurant that is part of its context, not imposed on it.